The before and after pictures are prerequisites for any company promoting a diet plan. But like those of champagne-drinking couples holding oversized lottery cheques, the ‘it could be you’ message is misleading. The winners are outnumbered by those who either fail to lose weight or, if they do, regain it shortly after the programme ends. 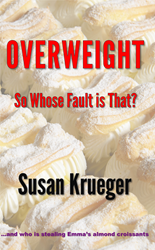 This is one of the problems encountered by Emma in Susan Krueger’s book Overweight – So Whose Fault is That? ISBN 978-0-9540977-2-1. The book paints a picture of the food and diet industries from the viewpoint of someone who finds a healthy diet is incompatible with her hectic lifestyle. Emma is organising a conference on diet and nutrition; the debate on the platform and her own struggle to lose weight illustrate why dieting alone will not halt the obesity epidemic. She discovers why her diet programme failed, that her trust in readymade meals is misplaced and realises nothing will change until the food industry is reformed. Krueger, who runs her own weight management and nutrition practice, feels the healthcare sector is being left to deal with a situation over which it has no control. However, she believes the NHS will eventually become both unwilling and unable to deal with the increase in patients suffering from obesity-related diseases. “If healthcare providers finally lose patience with the food industry we could see the phrase ‘sugar poisoning’ find its way into medical dictionaries,” she says. Using a short novel to popularise the issues we have with the food we eat, Krueger aims to dispel the myth created by diet plans that being overweight is largely the fault of the individual. Overweight – So Whose Fault is That? ISBN 978-0-9540977-2-1 is available in paperback, price £7.99. SUSAN KRUEGER is a nutritionist researching food chain efficiency and resilience. She advises organisations on ways to improve the diet and wellbeing of their customers and employees and has developed the YourFoodForLife programme which helps individuals and organisations develop a healthy relationship with food. Overweight - So Whose Fault is That? SampleFirst chapter of Overweight - So Whose Fault is That?